A marketer trying to reach a particularly tough-to-find demographic or maybe looking to reinvent its image can turn to an agency, a public-relations firm or a consulting group for help. Or they can just hire Captain America and Spider-Man. Marvel Entertainment has for decades quietly housed a small group focused on helping brands produce custom comics featuring the likes of revered characters like Captain America, Iron Man and the Hulk. The expanding Marvel Custom Solutions unit also helps marketers revamp their own characters, or occasionally weave their messages into existing Marvel comics, movies and TV shows. But ever since the original “Avengers” movie was released in 2012, executives at Marvel say a wider variety of advertisers are coming to them to create marketing programs–not just brands that are tied to each movie release. In fact, Marvel has helped produce custom content for a slew of brands you might not expect, ranging from Kiehl’s to Western Union, Lexus, Popsicle and Benefits Cosmetics. This year, the Walt Disney Co.-owned-firmhas entered into a unique marketing partnership with Adobe, which will culminate atComic-Con in San Diego later this week. As part of the “Make It With Creative Cloud” campaign, four students were selected from thousands of entrants to come up with original comics in conjunction with Marvel artists using the Marvel characters Thor, Black Widow, Captain America and Iron Man–all created using Adobe’s Creative Cloud software. The four lucky winners will present their work at Comic-Con, where Marvel will hand out 10,000 copies of each comic creation to attendees. Not only does Adobe get to provide these aspiring artists with a Marvel-branded comic (which should help these students impress many hiring managers when they look to get jobs), but the software giant also gets to present itself as a supporter of young creative talent while drafting off of Marvel’s cool factor. The Comic-Con campaign for Adobe is the latest such endeavor by Marvel as it looks to broaden its suite of offerings for marketers. Of course, Marvel’s parent company Disney is perhaps the gold standard when it comes to extracting every dollar from its entertainment franchises and characters. For example, the media giant is in the midst of introducing theme parks inspired by the animated smash hit “Frozen” in markets all over the world. Disney doesn’t break out revenue for the Marvel Custom Solutions group. Mr. Buckley was quick to point out that Marvel works with many ad agencies, including MRY in case of the Adobe deal. But the comic publisher offers something few other creative agencies can boast of: access to the artists and writers who actually work on comics featuring some of the most popular characters on the globe. Marvel isn’t alone in producing custom comic books and other content for brands. Rival DC Comics has helped marketers like General Mills redesign characters for the company’s Monsters Cereals brand through its DC Entertainment Sales Team. That group has also produced limited edition comics for TNT featuring the hosts of the show “Inside the NBA” interacting with members of the Justice League like Superman and Wonder Woman. Like Marvel, DC Comics tasks the same artists and writers who work on its top titles to work on comic projects funded by brands. Marvel’s in-house brand group has been at it since the 1970s. 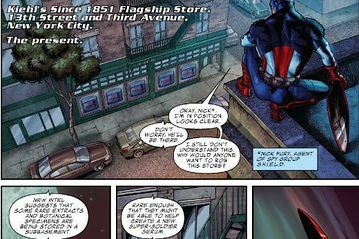 For years, the under-the-radar unit mostly produced custom comics for retailers selling Marvel DVDs. But when DVD sales started to wane a few years ago, “we had to reinvent ourselves,” said Mr. Buckley. Thankfully, starting in 2008 with “Iron Man“–the first movie released by Marvel’s brand new movie studio–the company began a streak of releasing annual hits, meaning that plenty of movie advertisers were looking for complementary comic work. But according to Mr. Buckley, over the past couple of years, Marvel has seen lots of non-movie advertisers come to the custom solutions group looking for multi-channel marketing efforts like custom comics, digital ads and original animation. Indeed, when you can boast of a brand that seemingly can’t miss at the box office, lots of advertisers are likely to look to glom on. And one thing Messrs Buckley and Rheingold emphasize is that Marvel’s characters appeal to multiple generations and demographics, giving them license to talk to a range of marketers. 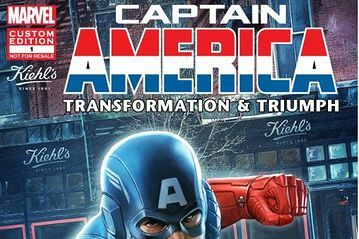 Take Kiehl’s, the skin-care brand that tapped Marvel in 2013 for a custom content program themed around “Captain America.” The deal included a comic that tied the character’s origin stories, which date back to the 1940s, to Kiehl’s history as a brand. Or look at the female-oriented Benefits Cosmetics, which rather than task Marvel with creating a custom comic featuring members of the Avengers, asked the company’s storytellers in 2012 to “Marvelize” theirexisting character Spy Gal. Then there’s Kimberly-Clark ‘sKMB +0.09% GoodNites, a product aimed at helping young children cope with bed-wetting. 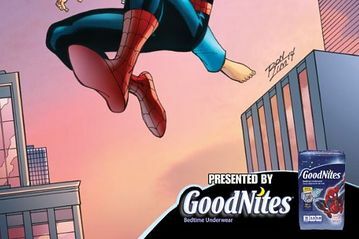 Melanie Huet, the director of child care for Kimberly-Clark, said that GoodNites had beenlicensing Marvel characters for its kids pull-ups for a few years when the two companies started exploring how they could work more closely together. As Ms. Huet explained, Kimberly-Clark’s research shows that one-sixth of kids experience bed-wetting at some point. Yet these kids are hard to reach in traditional media, not to mention that it’s difficult to deliver the message in an ad that bed-wetting is O.K. After all, who’s more inspiring than Spider-Man?